This salad is BEAUTIFUL, healthy, and delicious! 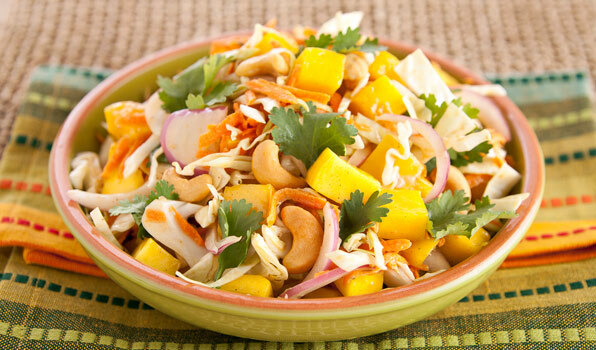 Use fresh mangos, if you can, but I have used frozen mangos, thawed and diced and they are very good in this salad. Add mango, cabbage, carrot, red onion and cilantro to a large bowl. For the dressing: Add apple cider vinegar, Jerk Marinade, honey, mayonnaise, vegetable oil and salt and pepper to a bowl. Whisk to combine. Toss salad with dressing. Garnish with cashews.